The workmanship of this antique writing table is of an extraordinary standard - even we were blown away by what we found. Don’t forget to choose maximum viewer quality before you watch in the bottom of the screen. To do this select – ‘Settings’ button – ‘Quality’ – ‘1080p’. This image below shows the table top before it was cleaned and re-polished. Restoration is a vital part of our business and the necessary measure to transform our antique writing tables that have been forgotten into tables that are magnificent once again. At Wallrocks we hand-select all our antique writing tables overseas and buy them in original condition to ensure their authenticity. It is an incredibly exciting part of the business to watch these antiques return to the original state intended by the designer, for you never quite know what lies beneath until it has been unveiled. Below is a short one minute video of one of the finest tables we have in our collection, attributed to the famous 19th century cabinet-maker to the Queen, Holland & Sons. 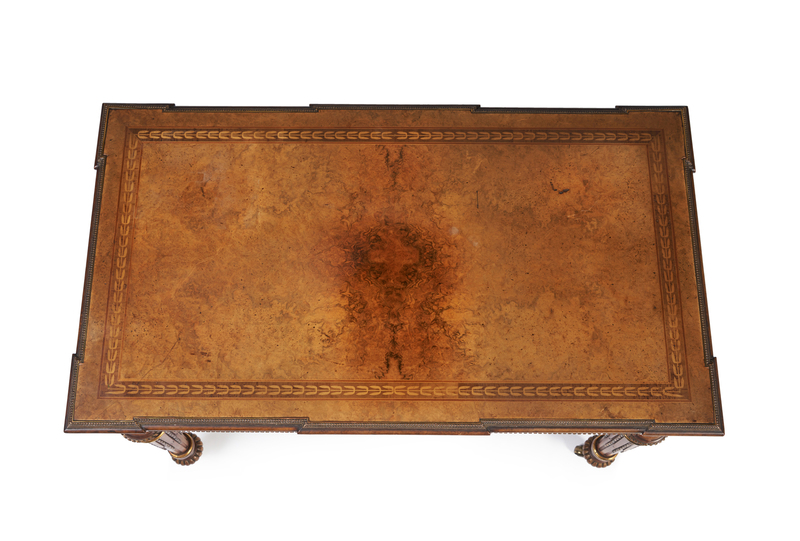 Click here to enquire about this antique writing table. The workmanship of this antique writing table is of an extraordinary standard, it has become very difficult to see this, masked as it is under centuries of polish which has turned opaque through centuries of exposure to sunlight and dirt. We gently cleaned and re-polished by hand the top surface only of this antique writing table, to unveil the detail, quality and beauty of what lies beneath. Even we were blown away by what we found. This outstanding 19th century antique writing table thought to be by the famous cabinet-maker Holland & Sons, is made of the finest quality book-matched burr walnut on the writing surface which has been inset with marquetry leaf motifs and satinwood string inlays over a frieze with three geometrically inlaid polished mahogany lined drawers all over embellished with exceptional quality original ormolu (gilded bronze) mounts, supported on four tapering fluted legs. What is unusual about these legs is the intentional carved break half way down which serves as an added detail only to be found in the very best furniture and antique writing tables. Ormolu decorates the flutes of each leg, the turned mouldings, along with the inner and outer perimeters of each drawer. Condition: The writing table top has been cleaned and polished in our workroom as a demonstration of how the table will present after full restoration. Holland & Sons 1803-1942 – Established in 1803 by William Holland, Holland and Sons was reputed for the magnificent design, materials and execution of their cabinetmaking during the 19th century, they were a close rival to Gillows of Lancaster. They became official cabinetmaker and upholsterer to the Queen, completing numerous Royal commissions including Windsor Castle and Balmoral, and were responsible for the Royal furniture audit conducted at Buckingham Palace in 1866. Other notorious commissions were for the British Museum and the New Houses of Parliament, and along with Gillows they shared the commission for the new Palace of Westminster. Employing over 350 highly skilled craftsmen by the mid 1850s, including a number of Englands foremost furniture designers, their work was to be found exhibited in every important exhibition in London, importantly the Great Exhibition of 1851, as well as participating in a number of international exhibitions throughout the century such as Paris in 1867 and 1872, and Vienna in 1873.